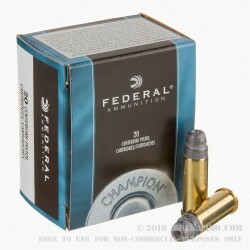 Manufactured and priced specifically for high-volume shooters, this .44 Special ammo by Federal Champion features a heavy 200gr lead semi-wadcutter hollow point (LSWHP) projectile. The LSWHP pretty much has one purpose: to make target shooting and scoring simple. These .44 S&W Spl rounds are low-velocity, and typically generate a muzzle velocity of around 870 fps. Federal outfits these rounds with their own factory fresh brass casings, Boxer-primers, and clean-burning powders. 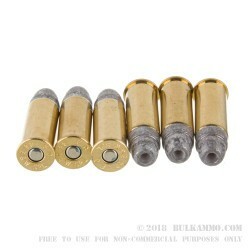 The casings are non-corrosive, and reloadable so the lives of these rounds doesn’t end with their first shot. If you are on the prowl for affordable yet high-quality training rounds, this 500-round bulk case of Federal Champion ammo is for you. 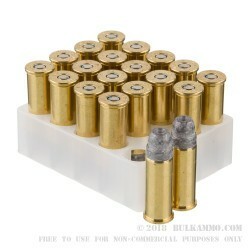 Federal ammo is American-made and manufactured in Anoka, MN.